Today’s blog post is from Amanda Zangari, a member of the New Horizons’ Geology, Geophysics and Imaging Team. She works at Southwest Research Institute in Boulder, Colorado. 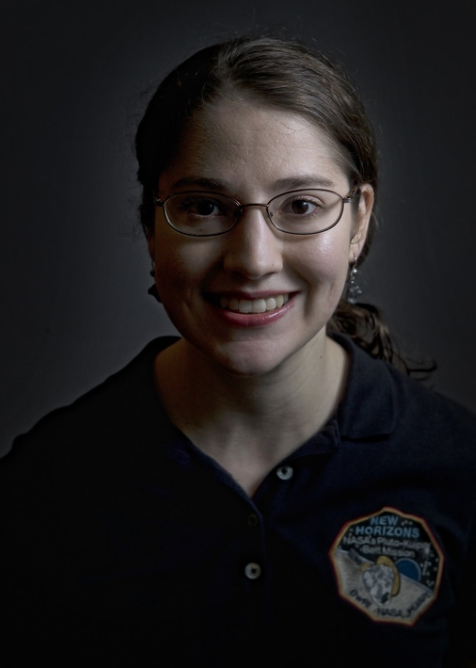 My name is Amanda Zangari, and I’ve been a postdoc on the New Horizons mission for 2 ½ years. It’s been a wild ride, and it’s amazing how the time has flown by. In the 85 years between Pluto’s discovery and the New Horizons flyby, we’ve learned enough about the Pluto system to fill a textbook and several scientific journals. Telescopes, cleverness, and lots and lots of math enabled us to figure out many of the basics of the Pluto-Charon system before New Horizons arrived, even if Pluto was just 11 pixels across in the best images taken from Earth. We knew that Pluto was brownish-red with dark and light patches, and that the surface was covered with nitrogen, methane and tholins—brown gunk made when UV light hits nitrogen and methane. 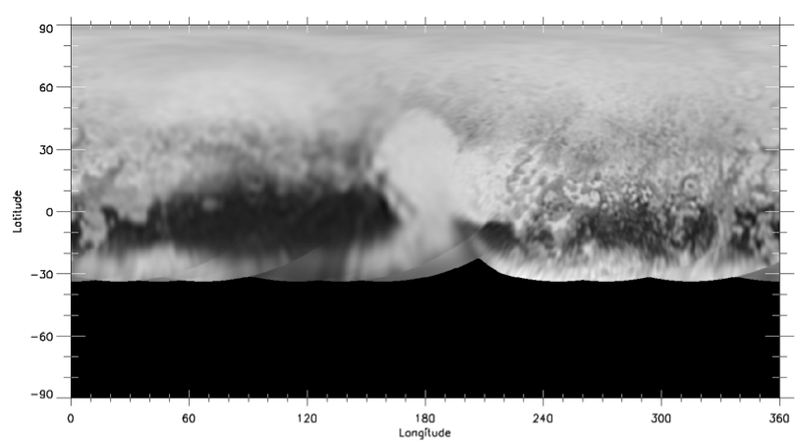 We also saw a patch of carbon monoxide at Pluto’s brightest spot, which turned out to be the area that forms the left side of Pluto’s ‘heart,’ which we informally call Sputnik Planum. We determined that Pluto’s moon Charon has a surface that is instead made of water ice and is gray in color. (Charon’s red “hair” at the north pole was a surprise!) We confirmed that we’d found all of Pluto’s small satellites. We also knew that Charon did not have an atmosphere and Pluto did, and we’ve been studying it for over 25 years. New Horizons finally brought Pluto and Charon into focus, and we got to see just how much of that patchy map — the result of measuring reflected light from Pluto at different angles — turned into mountains, ice flows and the bladed terrain that hasn’t been seen anywhere else in the solar system. One of my big interests is tying past ground-based observations together and comparing them to what has been seen by New Horizons. I’ve been working on several different projects to this effect. The first project took place during New Horizons’ journey to Pluto. I compiled all the available research journal articles to gather what measurements had been taken, and catalogued what longitude and latitude scale had been used to make measurements. 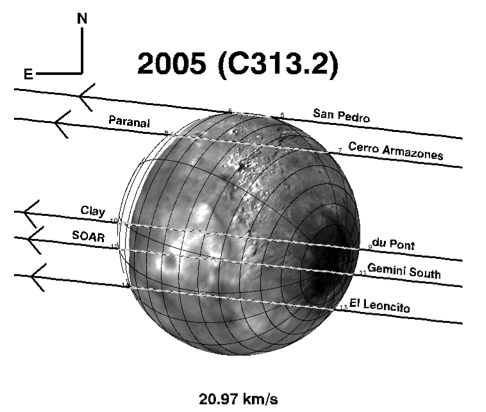 In 2009, the IAU reversed the direction of Pluto’s pole, reversing both the direction of longitude and latitude on Pluto. Without that change, Pluto’s ‘heart’ would be upside down! Even before the change, latitude and longitude had been expressed in multiple different formats, official or not. 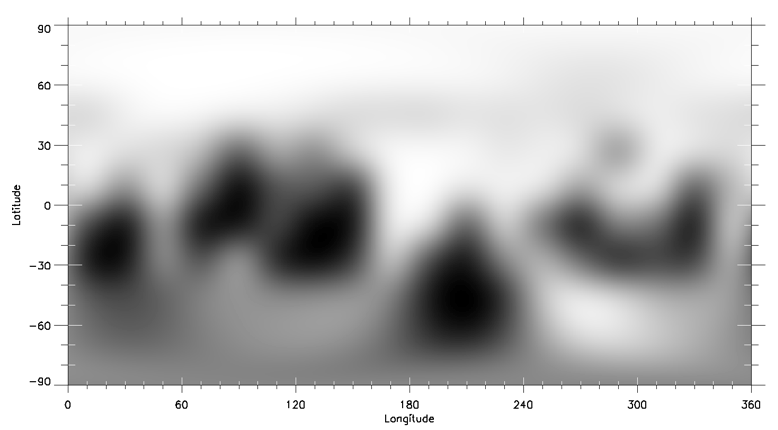 The next project I’m working on involves comparing measurements of Pluto’s brightness taken by the New Horizons spacecraft between 2013 and 2015 against Hubble Space Telescope observations from 2002 and 2003. We’d like to see how Pluto’s surface has changed in that time, as there is already possible evidence of change on Pluto between the 90s and the early 2000s. Finally, as you can see in the figure below, I’m looking at stellar occultations of Charon, using the Charon topography New Horizons imaged, to check if known features influenced these past results. Making ground-based comparisons to New Horizons is extremely important. Until we go back to Pluto (I’d love to see an orbiter), the only way we’ll be able to watch Pluto evolve is from Earth-based telescopes. If we’ve learned anything from the flyby, we’ve learned that Pluto is worth continuing to watch.